An investigation into something fishy! It started out looking like an open-and-shut-case of a dog having a Jimmy Riddle on the back seat of a Mini, but as time went on, we begun to smell a rat... or was it a fish? When the car was brought to us we were told that it had been lent to a friend and it was thought that their dog may have urinated in it... sure enough there was a bit of an ammonia type smell. So we took the customer's word on this. When trying to get rid of a odour, it is essential to find the source of the smell and remove that. Odour is usually caused by bacteria which will feed off the source of the smell. So although you may be able to kill the bacteria and remove the smell short term, if the substance they are feeding off remains, the smell will return. So we set about trying to find the source, which we assumed to be urine. We do this by using the kind of ultraviolet lights that you have often seen on the CBS TV series CSI: Crime Scene Investigation. The Alternative Light Sources (ALS) will make any protein show up as light patches (both fish and urine contain protein). However, an examination of the seats front and back showed no such staining. So we assumed that either somebody had already had a go at washing out the seats, or for some reason the lights were not working. We cleaned all the seats anyway and proceeded to apply a special treatment to kill urine odours. At first this seemed to do the trick, but before we had a chance to give the car back, the smell returned. But this time it smelled less like urine and more and more like fish. However, further examination of the car could find no trace of the source of the odour. Just about everybody at Clean Image had a sniff and a look around with the UV lights. It occurred to us that maybe this case wasn't as straight forward as we first though, and maybe this car had been sabotaged! As the days passed and we attempted several odour control methods and treatments, the smell would disappear but come back stronger, and it would change each time, going from fishy to a strong smell of rotten fish. By now we were convinced that somebody had hidden fish of some sort somewhere within the car but thorough examinations revealed nothing. So we had to think about this. We hadn't put this idea to the customer, because making the suggestion amounts to an accusation against the person they lent the car to. We needed to confirm our suspicions before we could say anything. So we thought about how somebody would go about sabotaging this car with fish. We have come across this kind of thing before, the last time prawns had been hidden within the convertible roof mechanism of a Mercedes, another time fish were put into an air conditioning system. However, these attacks had been carried out by men, and as a result, we believe the nature of the attack showed a technical approach. We suspected in this case that the attack was carried out by a woman and so it was unlikely they would get out a tool kit to dismantle the car in order to hide the fishy substance. This isn't a sexist comment, and this isn't to say that women are not capable of using a tool kit or dismantling a car, it's just that in our opinion men and women approach cars in different ways. Men admire the technology and function, where by contrast, women have other concerns. For example, when men bring their cars to be valeted they are most concerned with the paintwork and trim. By contrast, most women are not too concerned about the exteriors, they want the inside to be clean, sanitised and smelling clean. So we thought if you are a woman, and you have a hand full of rotten fish and you are hell bent on revenge, what do you do with it? We concluded that you would attack the seats... you would want the target of your vengeance to be sitting in the fish, smelling of it. And if we were right, we could actually narrow down the likely point of attack to the two front seats. However, the front seats didn't particularly smell of fish, in fact the smell seemed strongest in the back. And there was no trace of fish or stains either on or around the seats. But during our examination we did feel there was a slight smell coming from the passenger seat headrest, we took it out of the car and sniffed it but it didn't smell fishy. 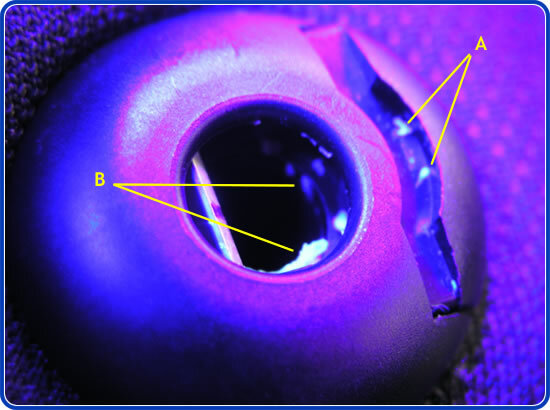 But when we shined a UV light on the holes that the headrest slotted into, we could see a couple of white flecks on the clips - shown on the photo below and marked 'A'. We set the camera to macro and took this photos, and it's only when we saw it on the computer screen that we could see more white flecks which we indicate with a 'B'. These may seem obvious from these photos, but it was very difficult to see with the naked eye and it wasn't clear if the light coloured stuff we could see inside the whole was a foreign object or stuffing from the seat. 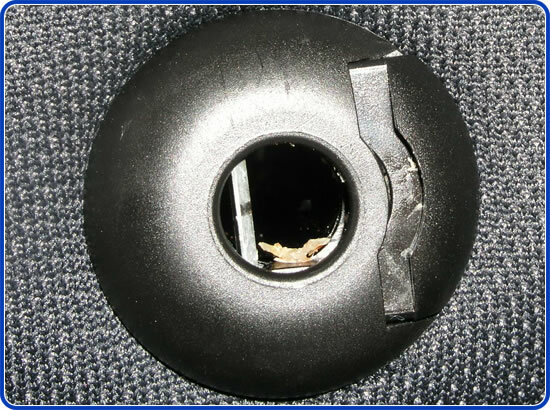 The hole and clip for the headrests. The same area - photo taken with a macro feature without UV light. The hole in the middle of this clip is only about 12mm across. It was only when I took a macro photo without UV and blew it up on the computer screen that I was sure that fish had been pushed down these holes - even though the smell let us know that this was obviously the source. We were now able to go back to the customer and tell them what we thought had happened. Luckily they saw the funny side. They allowed us to dismantle the seat and inside we found quite a large number of prawns in various states of decay (I will spare you the photos! ), once revealed, the odour of rotten fish could be smelt 20yrds away. By this point a week had passed and we had had some very hot weather -- it may be hard to believe but until this point, we weren't 100% sure we were actually dealing with fish. Our initial treatment of the car for urine had had some effect changing the nature of what we could smell, and because source of the odour was so deep within the seat it wasn't obvious where the smell was coming from even once we knew. All in all it was a very strange episode which was made very difficult because we started off with wrongly assumed information. Because the customer had assumed that a dog had urinated in the back, this literally threw us off the scent. In future we will ask a lot more questions before starting work. of masking the odour, combines with it to make a slightly different smell. Why it's not always so easy to remove the smell of smoke!